We just finished watching a new family friendly movie called Ring The Bell. This movie is about Rob Decker a sports agent from the city who seems to have it all together. His newest recruit is a high school baseball player from a small town in the middle of nowhere. Rob is used to signing his recruits, but the new guy he is looking at has other plans for his life. After having car trouble Rob spends some time in this slow paced town waiting for the repairs to be completed. Through the local people Rob soon discovers that there is more to life than playing baseball, and becoming famous & rich. 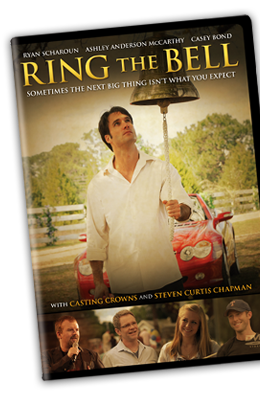 You may recognize several people in Ring The Bell. Mark Hall and his band Casting Crowns, Steven Curtis Chapman, and Matthew West all play a role along with several Major League Baseball all-stars John Kruk, Rick Sutcliffe, and Ben Zobrist. My family enjoyed this movie together, but like all things we discuss matters as a family while we are viewing them. We really appreciate that this movie teaches a good lesson is very clean and family friendly, but we believe that the plan of salvation is more than just asking Jesus into your heart. Finding Nemo at the moment. I enjoyed watching Soul Surfer with my family. Right now, my kiddos are into any of the disney/pixar movies! My son and I like Tangled. I love too many to have a favorite. One of my current favorites is Courageous.